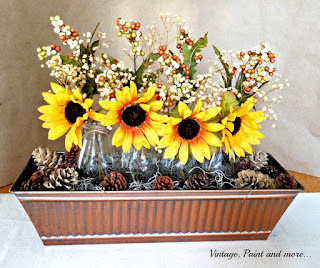 Hi everyone, I have a simple fall vignette I did with a vintage pitcher that I would like to share with you today. The last time I posted was over a month ago when I told you I was closing down the blog for a while due to health issues. I am doing much better now thanks to a lot of prayers, a great doctor and . "Thank you" to everyone who sent their prayers, thoughts, and well wishes my way for a speedy recovery. I am so lucky to have all of you in my life. I missed blogging so much that I have decided it is time for me to get back to work. So today I am bringing you a simple vignette I have in our family room. This is our huge ottoman/coffee table that I picked up from a thrift store a couple of years ago for $15. I couldn't believe it - it was exactly what I wanted and I think the guy just wanted it out of his store because it was so large. It's perfect for our family - it is so multifunctional - we use it for a coffee table, snacking, homework, footstool and as extra seating when we need it. I have often thought about making a drop cloth cover for it but I can't make myself cover it up because it is so easy to care for. All I have to do to keep it clean is wipe it with a damp clothe. How much easier could that be. So even though I am a drop cloth fanatic this will remain uncovered for now. I placed a long striped fleece blanket diagonally across the ottoman to give it a bit of color for this season. 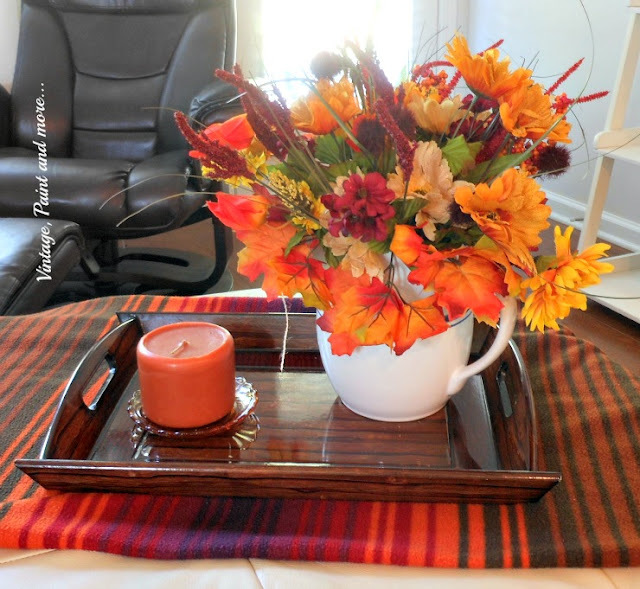 I love using oranges, browns, golds and burgundies in my fall decor. ( all purchased at the dollar store). I love all the different textures they give us. The pitcher has a touch of blue in the stripe around it that blends in with the blues in this room. I found this pitcher while thrifting this past week - $2. Can't beat the price. I also have a small amber glass saucer from the same thrift store - $.50 that is holding one of our orange candles sitting in the tray. Don't you just love how such a simple grouping can bring so much color, texture and cheer into an other wise blah space. 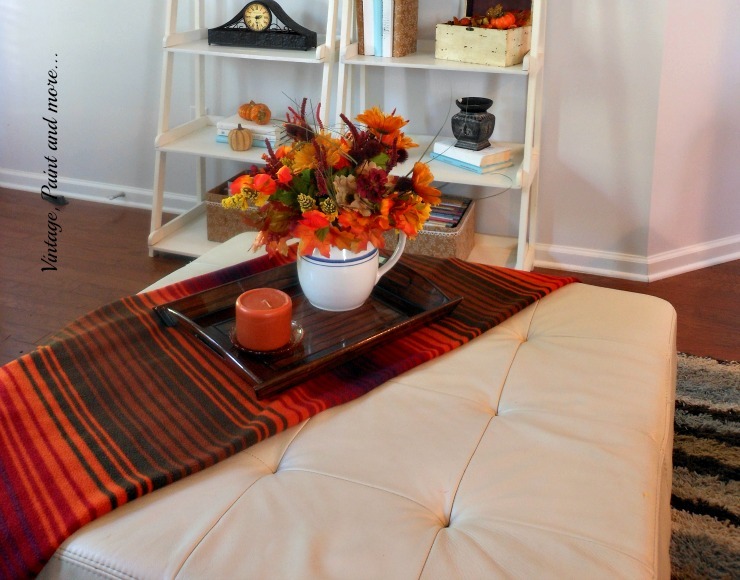 It certainly brings Fall into this room in a big way. 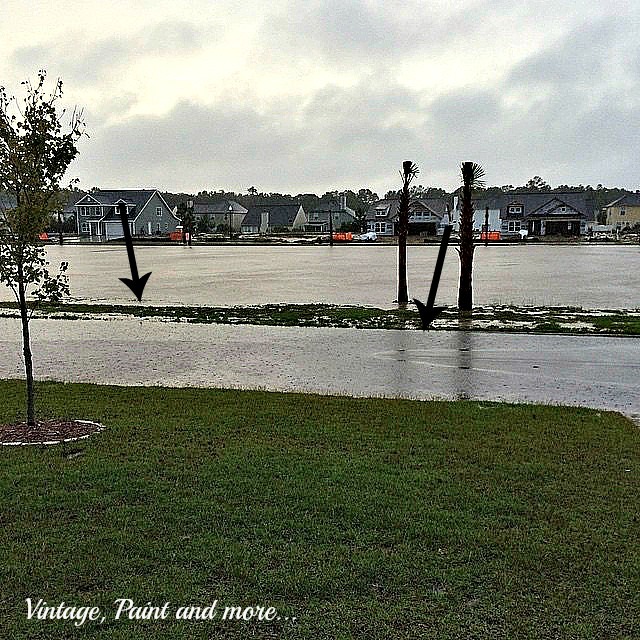 I thought I would also update you on our "flood conditions" this past weekend. As most of you know we are in Myrtle Beach, SC. 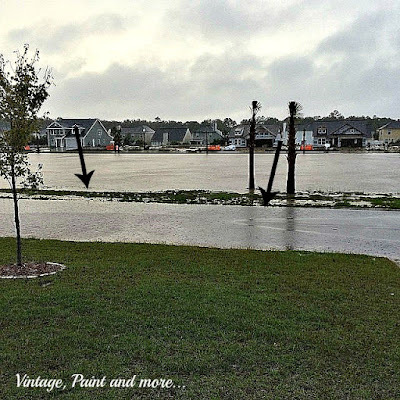 Although there was flooding in this area our city fared so much better than other areas in the state. 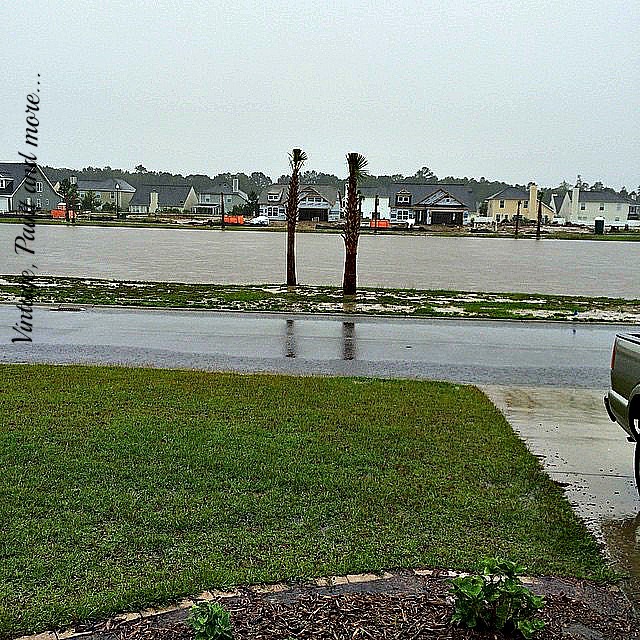 The below picture shows the "lake"/retention pond right in front of our house. 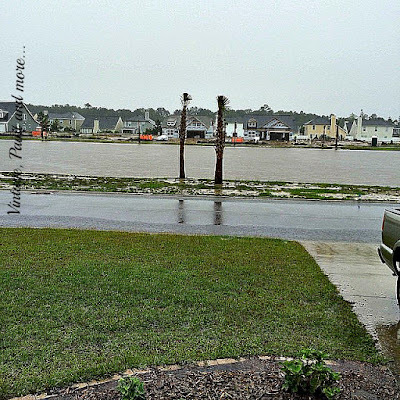 This is Saturday when Charleston and Columbia were being hit so hard. And remained this way on Sunday when Columbia took its hardest hit. The lake is to the top but staying within its bounds. However when we woke on Monday morning the storm had again swung around and dumped a ton of water on us and this is what the lake looked like that morning. You can see at the arrows how the water in the lake and the water in the road met - thankful it was only a few inches deep and by mid afternoon when the rain had stopped the waters receded. The community in the back of the picture had ankle deep water standing in their roads making it difficult for them to get out. Albeit we did have some problems here with high waters, washed out roads and closed roads making it difficult to get around we fared much better than Columbia. Our granddaughter goes to USC and came home this weekend to celebrate her sister's birthday. We are so thankful or she would have been caught in all that. God is so good to us and looks out for us in so many ways. So although we are doing quite well - the rest of South Carolina needs every one's prayers for a speedy recovery as we are far from being back to normal. Thank you all for your thoughts and prayers. I will be linking to the parties found on the Where I Party page. Pleas visit them and check out the great inspiration and creativeness found at each one. I'm so glad to know that you're feeling well and back!!! Happy to know that the floods did not affected your area. 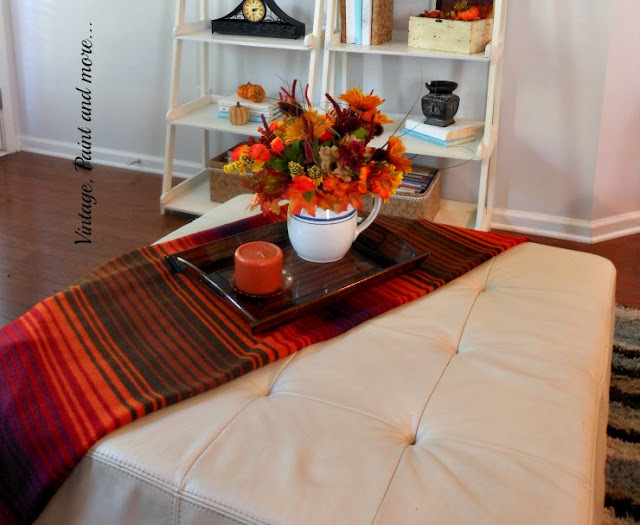 The ottoman's fall vignette is perfect. 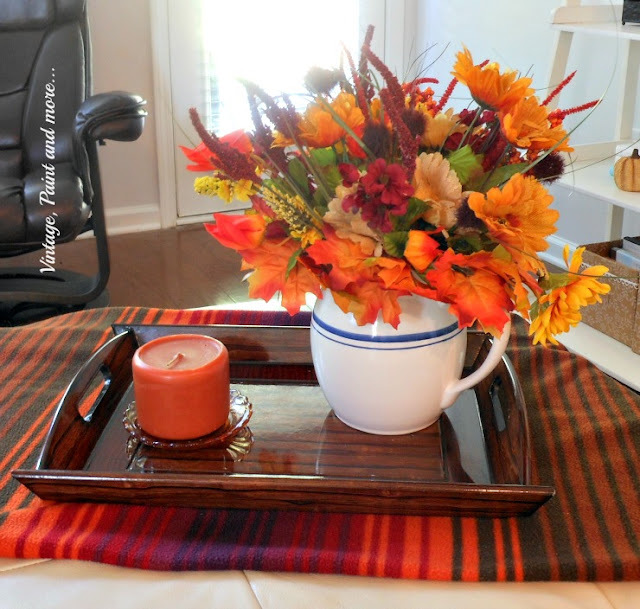 I especially love how all of the items used came together and made the perfect arrangement!!! Thank you Oliva - it's great to be back. We were lucky that we had very little damage considering those close to us. Cathy, first of all, I am very glad to hear your home was unscathed. 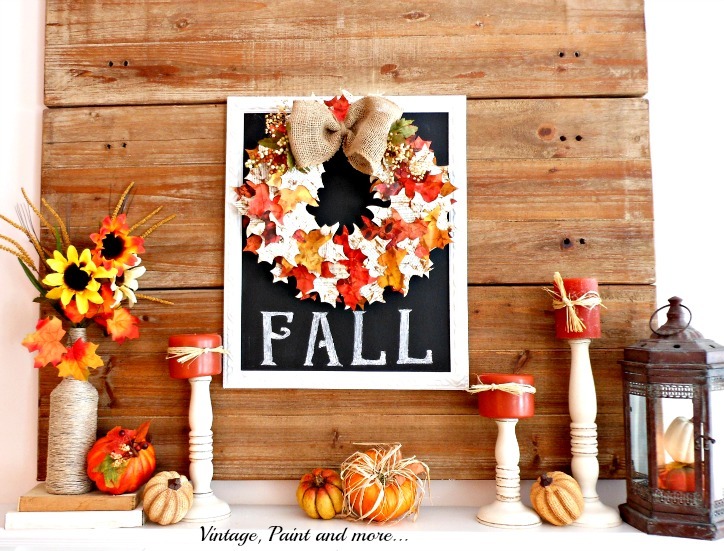 Secondly, I am thrilled to hear you are feeling well enough to be back at blogging (and even decorating for fall - it's beautiful). Thirdly, welcome back as co-host of One More Time, and thank you! What was already a hugely successful link party just got that much more so! Thank you so much Rita I am so happy to be back and blogging again. And I am so thrilled to back to Share It One More Time - I did miss all of you a lot. Thank you so much Diana - it's so good to be back. Thank you for inviting me to your parties - I will certainly be stoppng by. It is great to hear that you is doing well. Your vignette is beautiful. I love the beautiful Fall colors. I was just looking at photos from the flooding today. It is so sad. But thank God it is not as bad as it could have been. I pray that the folks in Columbia (effected by the flooding) receives a speedy restoration. Thank you so much Trish. We were lucky that the flood did so little in this area. Our granddaughter goes to USC and was just able to return to Columbia this week - they one of the areas hardest hit but are taking it in stride and working together to get back to as normal as possible. Lovely to hear you are doing well and that the rain and water were kind to you. 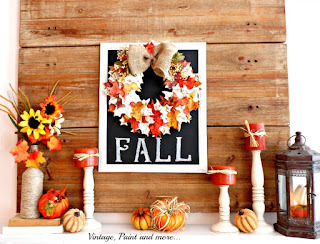 I love fall colors and your vignette is lovely. Pretty color and texture. The ottoman was a great find. Thank you so much it's great to be back. 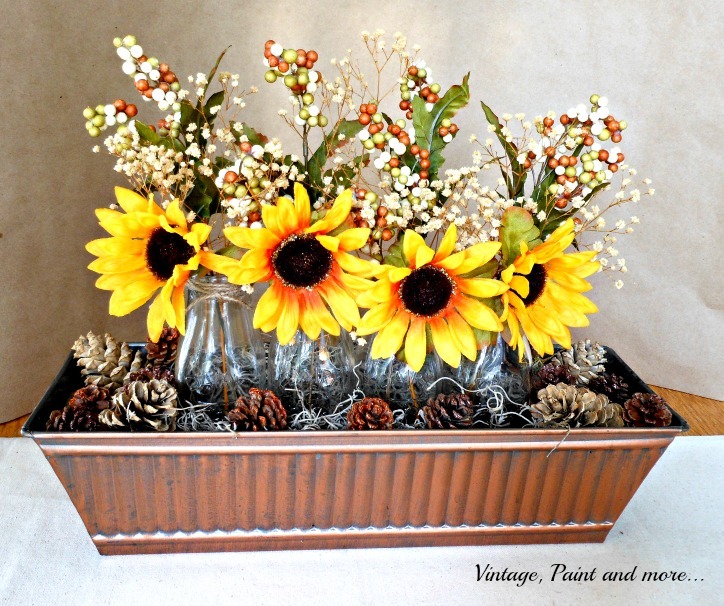 I love the colors of fall as well and am so glad I chose those this year - we did need a bit of cheering with all the rain.